Talk about rust. I’m amazed and proud to see what people are bringing back to life. Keep up the good work, Dylan. 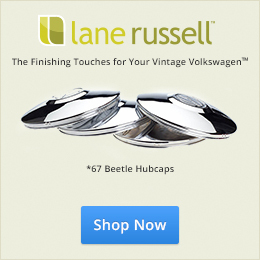 The ’67 Beetle community is cheering you on. A little update. Our convertible is well underway, besides the parts we previously purchased last summer; the parts are stacking up with more on the way. Some of the stuff we have gotten is a good used (Cleaned and painted too! Good for lazy me…) front beam, as ours was both bent, and rusted out. We also decided to upgrade to disc brakes with a wide 5 bolt pattern, because the car will be used in daily service; as well as drop spindles… Yes, I know I know, they aren’t “stock””, but I enjoy them a little lower. New heater channels are en route, and we already have the new pan halves and ‘vert reinforcement rails. 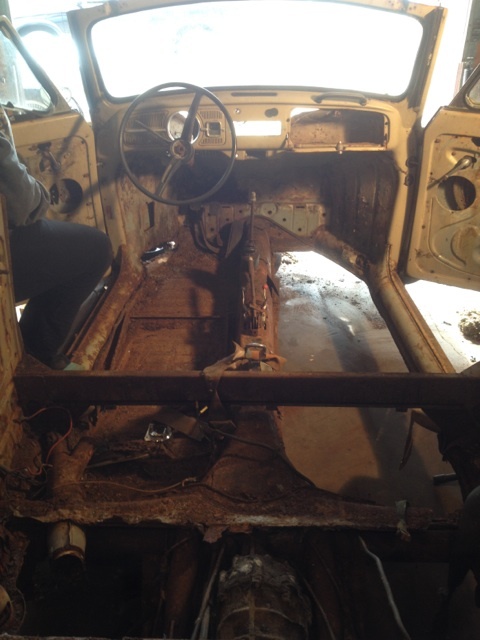 We were able to get parts from a ’67 sedan, such as a new front clip, drivers side front quarter panel, and better rear fender wells. As we were cleaning out the car more, discovering more rust, we discovered some things. First, the original jack. I find this amazing, as the car was in a collision once, and already has a new partial front clip spliced in. I honestly haven’t seen a bug in my area with it’s original jack still in the car. Found random trinkets, old bicycle parts, campaign stickers, couple of corroded batteries (The mud was pretty high in areas, we were scooping and shoveling it out). Secondly, the fact that we are almost literally building this car from the ground up; and we want it on the road THIS SUMMER. The goal is the latest the end of June, paint job or not. I’ve attached a couple pictures to show some of the stuff we have done, and you may see just a hint of the cancer we are repairing; it’s by far the worst one I have ever welded back together. Thanks, Dylan, for sharing your ’67 with 1967beetle.com. 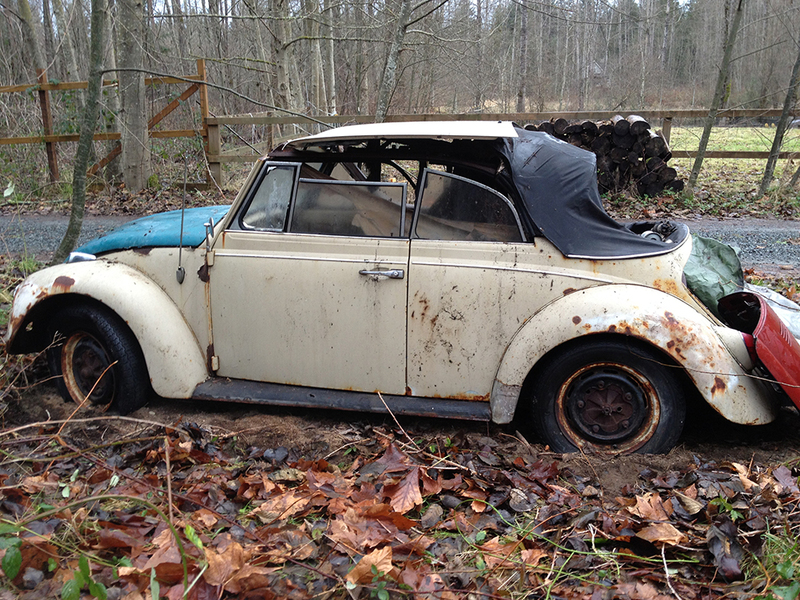 Golly, Gee Wiz … another convertible being brought back from the abyss! Yeah for you Dylan! Kudos. I’ve never take a project like that. You mean, brought back from the bottom of the ocean! Ha. Wow, that’s one heck of a restoration project. Congratulations and the best of luck finishing the project. Once you are driving this VW convertible, restored from such a seemingly hopeless point, will be very satisfying. May all your welds penetrate and be true. So glad to see a ’67 “back from the grave”, especially a convertible. Congratulations! I was also fortunate enough to get the original jack and handle with mine, too. Thanks for the encouragement guys! It sure makes it easier to keep forging ahead with a great set of folks at your back. I’ll keep you all updated with more photo’s of progress and despair. My wife and I are headed over to it tomorrow (Since the extent of the rust requires rear wheel well replacements, heater channels, obviously support rails, and numerous other repairs; we are using a portion of one of my grandfathers warehouses to tear it down. Sadly, that is two hours away!). I desire to see great progress tomorrow morning, hopefully even welding sparks to brighten (And burn) my day. Keep us posted! Take photos so we can see your progress. Send them to me and I’ll be sure to update the article.